Marking the first large-scale artistic collaboration between the United States and Cuba, the Cuban American Youth Orchestra (CAYO) embarks on its debut full orchestra tour next spring: May 20-27, 2019. Presented by Classical Movements—the world’s leading concert tour company to Cuba—in association with the Cuban Institute of Music and the National Center for Concert Music, CAYO’s “Juntos en Armonía/Together in Harmony” tour sees the newly formed ensemble—approximately 40 American and 40 Cuban student musicians, all aged 18-24—make its debut in Havana and other provincial destinations in the country. Under the baton of lauded conductor and pedagogue James Ross, CAYO performs a program showcasing the world premiere of a new composition by the island republic’s Guido López-Gavilán, commissioned by the Paulus Fund in conjunction with the American Composers Forum. Building on the success of pilot programs conducted over the past year, CAYO’s inaugural tour harnesses the power of cultural diplomacy to support Cuban musicians and promote harmony and understanding between the U.S. and her long-estranged neighbor. With the guidance of top Cuban and American institutions, educators and performers, CAYO’s members will be selected by audition over the coming months. Kraut notes: “Our intent is to find not just the best musicians, but the students most open to this cultural exchange experience, and most poised to act as ambassadors for their country.” In preparation for their first performances together, the 80 college-aged musicians will rehearse with handpicked faculty mentors from both countries: Cuban professionals from local institutions, and 11 members of the Minnesota Orchestra, including first associate concertmaster Susie Park, principal flute Adam Kuenzel, principal oboe John Snow, principal horn Mike Gast, and principal trumpet Manny Laureano. During their week together in Cuba, besides helping to lead the young musicians in sectionals, lessons, and masterclasses, the U.S. mentors will also perform alongside their Cuban counterparts in a special chamber concert. Like Rena Kraut, herself an active orchestral and chamber musician as well as a dedicated educator, all 11 of the U.S. faculty mentors were members of the Minnesota Orchestra three years ago, when it became the millennium’s first U.S. orchestra to perform in Cuba, a project also organized by Classical Movements. Over five intensive days in Havana that saw the orchestra give two sold-out concerts, work with high-school and college students, play side-by-side with a conservatory youth orchestra, and jam with local musicians and dancers after hours, they experienced the value of cultural diplomacy firsthand. As the New York Times reported, the opening concert “was greeted not only as a rare chance to hear an orchestra from overseas, but as a symbol of the rapprochement between the United States and Cuba.” It was after witnessing the benefits of such bilateral collaboration for the young musicians involved that Kraut determined to create further opportunities for cultural youth exchange between the two countries, and the seeds of CAYO were sown. Next, for this year’s Spring Academy, CAYO invited four pre-professional Cuban wind players to take part in a week-long residency in the Twin Cities. Because of new travel restrictions, created by the suspension of visa services at the U.S. Embassy in Havana, only those Cubans holding dual nationality with Spain were eligible for selection. Nevertheless, the program once again fulfilled its mission with aplomb. As Minnesota Public Radio reported, the four talented young artists gave several informal performances, one of them after a Minnesota Orchestra concert; performed at local Latino-majority schools; took part in masterclasses; performed and participated in an open Q&A about Cuban entrepreneurship at the Carlson School of Management; and explored cutting-edge performance facilities at the Wenger Corporation headquarters. Their residency culminated with a spontaneous international jam session, when Cuban musicians Elio Hernández Rojas and Oscar Cruz joined renowned organist Cameron Carpenter onstage after his appearance with the Minnesota Orchestra. Now in his inaugural season as Music Director of Virginia’s Alexandria Symphony, James Ross also serves as conductor of Spain’s Orquestra Simfònica del Vallès, as a member of the conducting faculty at New York’s Juilliard School, and as Orchestra Director of the National Youth Orchestra USA at Carnegie Hall. Besides holding previous positions as Assistant Conductor of the Boston Symphony and Music Director of the Yale Symphony, he has led ensembles including the Kennedy Center’s National Symphony Orchestra, Leipzig Gewandhaus Orchestra, Royal Stockholm Philharmonic, and Les Arts Florissants. 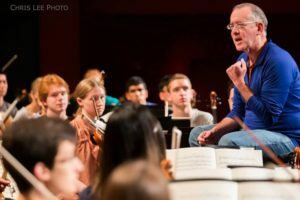 He recently completed a 16-year tenure as Professor and Director of Orchestral Activities at the University of Maryland. Classical Movements has worked in Cuba, on and off, since 1995. In 2010, responding to revived interest, Classical Movements resumed touring to Cuba, curating unique and truly meaningful experiences for more than 25 esteemed musical ensembles, and thereby becoming the world’s leading concert tour company to Cuba. After President Obama announced the resumption of diplomatic relations with the republic in 2015, Classical Movements produced an historic tour for the Minnesota Orchestra, the first professional U.S. orchestra to perform in Cuba in more than 15 years. 102 musicians performed two sold-out concerts at the Teatro Nacional, receiving standing ovations from enthusiastic and emotional audiences.